In case you have been living underneath a fitness rock recently, the TRX is one of the newest pieces of fitness equipment invading local gyms. TRX exercises use your body weight as the resistance, and can be easily customized to each person's individual skill and strength level. The TRX is essentially a long strap with two loops and handles at either end. It connects overhead, whether it is to a doorframe or some sort of support structure and hangs slightly above the ground. It is highly versatile and be be used to target muscles all around your body. This page, however, will focus solely on TRX exercises for your lower body. In terms of the golf swing, having a strong lower half is essential for stability. An unbalanced golf swing can lead to poor shots! Strengthening all of the key musculature in your legs should be a significant component of your golf weight training program. 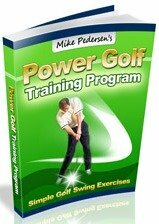 Taking a step back and looking at the grand scheme of golf exercises, TRX suspension training certainly falls under the advanced category. These are not exercises that beginners should start off with. The TRX creates instability, and although improving stability throughout your entire body is very important for golfers, those new to working out should probably try something a little more traditional first. However, if you are more experienced and are looking for a new challenge, the TRX is a great place to start! In addition to basic strengthening exercises, the TRX can also be utilized for power development via quick muscle contractions and bursts of strength. Also, don't forget to check out TRX workouts for your arms and for the core. -Lie on the ground on your back, and place each foot through the loops. -Push down with your legs, and elevate your buttocks and low back off of the ground. Hold about 5 seconds before returning to the starting position. -Lie on the ground on your back, with each foot in the loops. -Elevate your buttocks off of the ground, and at the same time bend your knees back to perform the curl. -Maintain the elevated position and perform hamstring curls repetitively. -Stand a few feet away with your back to the TRX, and extend one leg back, placing your foot through the loop. -Rest that leg in the loop. -Slowly bend your stance leg to perform the lunge, bending only as far as comfortable. Also, make sure that the knee on your stance leg doesn't excessively travel forward over top of your foot. You essentially want to keep your upper body upright, and have your body weight travel straight down as opposed to forward and down. -Face the TRX, and grab both handles. -Lean back to remove all slack, and perform a deep squat by bending both at the knees and your hips. Your buttocks should go back, like you are trying to sit on a chair. Plyometric Version - Instead of slowly rising out of the squat, quickly burst upward and perform a small jump. Immediately squat again upon landing. -Face the TRX, and grasp the handles with each hand. -Lean back and remove all slack from the straps. -Kick one of your legs forward, so that you are only standing on one foot. Keep the forward leg off of the ground. -Bend your stance knee, and flex at your hips (sticking your rear end back) to perform the squat. -Stand back up and repeat. Plyometric variation - If you are looking for more power, quickly rise out of the squat and perform a small jump! Upon landing, immediately go back down into the next squat.